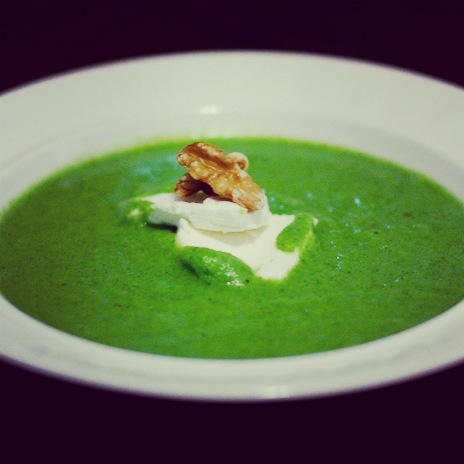 Mat Meg // Broccoli soup with goat cheese and walnuts recipe! Many of you asked for the recipes we used to make food at the Yoga and Creativity Retreats in January so wanted to create a series to share recipes we picked up along the way. Here´s a super easy and tasty broccoli soup from our friend Gordon! It´s full of goodness, takes minutes, and is vegan or vegetarian depending if you add the goat cheese, of course! Oh and personally, i don´t add olive oil at the end but you can if if floats your boat. I tend to use most of the stalk as well as the florets, so cut off the parts you want to use in the soup. Boil water in a pan, and add a little Himalayan salt. Put on lid and gook for 3-4 mins. If you are using goat cheese, warm your knife (in hot water for a clean cut) then slice up the badboy in preparation (around 1 slice per person is good). Test the broccoli with a knife or fork, it should gently press in. Drain the broccoli but keep the water. Put the broccoli in the blender and add small lashings of the water it was boiled in (around half the blender full). Whizz it up until smooth, add more seasoning if required. Place the goat cheese and walnuts into your bowl, then pour into your bowl. Enjoy! This entry was posted in health, inspiration, lifestyle, recipes and tagged broccoli soup, goats cheese, recipe, vegan, vegetarian, walnuts. Bookmark the permalink. ← Lately // Healing…Plus a Reminder: No class at Herosalen tonight or Sunday!